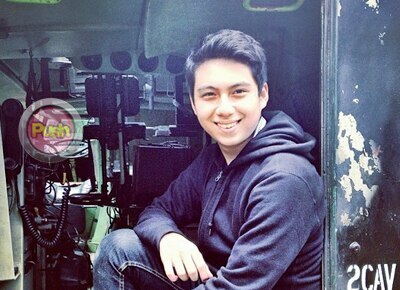 Exclusive: Will AJ Perez's brother Gello join showbiz? Push.com.ph talks to AJ Perez’s younger brother Gello and asks about his thoughts about show business. When asked by Push.com.ph if he has plans to join showbiz like his older brother AJ Perez, Gello Perez said that he is still weighing his options at the moment. Gello admitted though that he finds show business interesting, especially since he got to witness firsthand how it works through his late brother. "It's interesting. All the time, we visit the set don sa may Laguna sa taping niya (AJ’s taping), that's interesting to see the behind the scenes and it was interesting to see him act and it’s actually a good thing to try, it’s fun,” he said. He underscored that he has no final plans yet if he will venture to acting as soon as he graduates from high school. "I don’t know yet about my plan in the future, but right now I’m just focusing on my studies sa Ateneo. I want to try different things but I don’t know if I can do it yet ‘cause I have school, but I’m willing to do different stuff and I think acting is a good thing to try." Gello shared that his brother serves as an inspiration and motivation when it comes to confidence and pursuing one’s interests. "What I always admired about him is hindi siya nahihiya, something na hopefully makamit ko rin, na he's not afraid to do things and kasi ako I hesitate on doing some stuff, I get nervous, but he said na ‘Just do it. Huwag kang mahiya.’ That’s something that I always keep in mind,” he stated. This month marks the third death anniversary of his late brother. Gello relayed the things that he misses the most about him. “I missed having moments with him and his humor definitely because he always makes us laugh in the house. He is very humorous, para siyang clown of the family,” he said.